Opal-AN: Mineral information, data and localities. 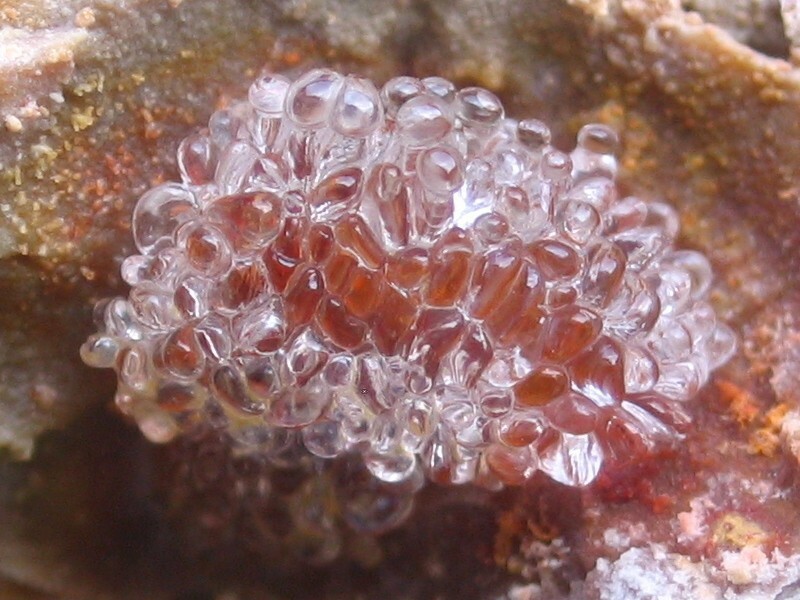 Opal-AN is a term for amorphous opal with a glass-like structure (Graetsch, 1994). The "A" in the name stands for amorphous; the subscript "N" is to imply its structure is network-like similar to silica glass; however, it still contains about 3-8% water, both as molecular water and bound in silanole (SiOH) groups. 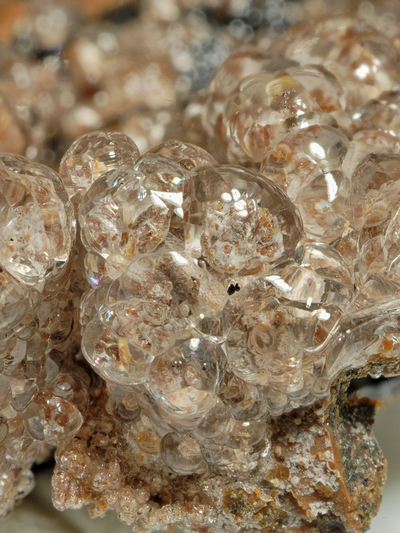 This form of opal occurs as hyalite in volcanic and pegmatite environments where the silica deposits from the gas phase (Flörke et al, 1973) and forms globular and irregular crusts. Because of its homogeneous internal structure, it does not show opalescence and is transparent if pure. The refractive index varies slightly with water content and lies between 1.44 and 1.46 (Graetsch, 1994). Quartz 132 photos of Opal-AN associated with Quartz on mindat.org. Fluorite 131 photos of Opal-AN associated with Fluorite on mindat.org. Schorl 130 photos of Opal-AN associated with Schorl on mindat.org. Muscovite 79 photos of Opal-AN associated with Muscovite on mindat.org. Feldspar Group 78 photos of Opal-AN associated with Feldspar Group on mindat.org. Smoky Quartz 78 photos of Opal-AN associated with Smoky Quartz on mindat.org. Carbonate-rich Fluorapatite 63 photos of Opal-AN associated with Carbonate-rich Fluorapatite on mindat.org. Aquamarine 47 photos of Opal-AN associated with Aquamarine on mindat.org. Orthoclase 46 photos of Opal-AN associated with Orthoclase on mindat.org. Topaz 44 photos of Opal-AN associated with Topaz on mindat.org. Flörke, O.W., Jones, J.B., Segnit, E.R. (1973) The genesis of hyalite. Neues Jahrbuch der Mineralogie, Monatshefte, H.2, 82-89. The following Opal-AN specimens are currently listed for sale on minfind.com. Pers. Comm. M. Willoughby. Found on specimen with Olivenite. Collection of M. Willoughby. Personal collection of M. Willoughby. Birch, W.D. & Henry D.A. (1993) Phosphate Minerals of Victoria. The Mineralogical Society of Victoria - Special publication No.3 (192p) pp.83-90. Schebesta, K. (1983) Der Pauliberg - Eine Micromountfundstelle vor den Toren Wiens. Eisenblüte, 4 (10), 8-11.; U. Kolitsch, W. Postl, H.-P. Bojar and W. Trattner (2009): Die Mineralvorkommen im Basalt des Pauliberges. In: Autorenkollektiv (Red. M. A. Götzinger und P. Huber) (2009): Die Mineralien des Burgenlandes - Geologie, Mineralogie und mineralische Rohstoffe. – Wissenschaftliche Arbeiten aus dem Burgenland, Band 126, Amt der Burgenländischen Landesregierung, Abteilung 7 - Landesmuseum, Eisenstadt, 83-99. Harald Schillhammer collection; Kolitsch, U., Schillhammer, H. & Lamatsch, P. (2015): 1936) Analcim, Axinit-(Fe), Chamosit, Datolith, Gips, Heulandit-Ca, Hyalit, Jarosit, Klinochlor, Klinoptilolith-Ca, Laumontit, Malachit, Molybdänit, Siderit, Sphalerit und Uraninit vom Steinbruch Hengl bei Eibenstein an der Thaya, Waldviertel, Niederösterreich. Pp. 243-245 in Niedermayr, G. et al. (2015): Neue Mineralfunde aus Österreich LXIV. Carinthia II, 205./125., 207-280. Weissensteiner, G. (1975) : Uranmineralien der Koralpe. In : Mineralogie Mitteilungen Band 42,Joanneum, Graz, p.27(283). Niedermayr, G. (1987): 672. Heulandit und Opal vom Traunkraftwerk Pucking, Oberösterrich. Pp. 306-307 in NIEDERMAYR, G., BRANDSTÄTTER, F., MOSER, B. & POSTL, W. (1987): Neue Mineralfunde aus Österreich XXXVI. Carinthia II, 177./97., 283-329.; R. Exel: Die Mineralien und Erzlagerstätten Österreichs (1993); Kolitsch, U. (2015): 1935) Almandin, Aragonit, Baryt, Heulandit-Na, Klinoptilolith-Na, ein Magnesiochromit-Spinell-Mischkristall und Schwefel vom Traunkraftwerk Pucking, Oberösterreich. Pp. 241-243 in Niedermayr, G. et al. (2015): Neue Mineralfunde aus Österreich LXIV. Carinthia II, 205./125., 207-280.
ⓘ Beryl Pit (Quadeville East mine) ? Cícha J., Sejkora J.: Vanadový wavellit, variscit a další fosfáty z grafitických kvarcitů v Čížové u Písku. Minerál, 2011, 19, 1, 23-32. Bischof, C. (1874): Polytechnisches Journal 174, 140-146. Ritter, K.-H. (1978): Hyalit und Langit von Lavrion. Lapis, 3(10), 11. Tabacchi C. (1974) - Pegmatiti della Val Grosina (Sondrio) in - Notizie del Gruppo Min. Lombardo, Milano, fasc.4, Dec. 1974 pp. 85-86 ; Bedognè, F., Montrasio, A., Sciesa, E. (2006) I minerali della media-alta Valtellina, delle Orobie valtellinesi e della Val Poschiavo. Aggiornamenti sulle altre località della provincia di Sondrio. Bettini, Sondrio, 255 pp. Alfredo Petrov, field collected, and widespread in innumerable japanese collections. Miyawaki, R., Matsubara, S., Yokoyama, K., Takeuchi, K., Terada, Y., & Nakai, I. (2000). Kozoite-(Nd), Nd (CO3)(OH), a new mineral in an alkali olivine basalt from Hizen-cho, Saga Prefecture, Japan. American Mineralogist, 85(7-8), 1076-1081. Cook, R.B. (2013) Connoisseur's Choice: Buergerite (Fluor-buergerite) Mexquitic, San Luis Potosi, Mexico. Rocks & Minerals, 88, #5, 442-446. Brotheridge, J.M.A., Browne, P.R.L., Hochstein, M.P. (1995) The Ngatamariki geothermal field New Zealand: surface manifestations - past and present in Proceedings of the 17th New Zealand Geothermal Workshop 1995. Presented by the Geothermal Institute, The university of Auckland in conjunction with The Centre for Continuing Education. p61. Mesiarkinová, M. & Ozdín, D. (2009) Study of hydrothermal SiO2 mineralization on the locality Ľubietová - Jamešná (Slovakia). Mitt. Österreich. Mineralog. Gesellschaft, 155, p. 101. Koděra, M., Andrusovová-Vlčeková, G., Belešová, O., Briatková, D., Dávidová, Š., Fejdiová, V., Hurai, V., Chovan, M., Nelišerová, E., Ženiš, P. (1986-1990): Topografická mineralógia Slovenska. I-III. Veda, Bratislava, 1592 p.
Wolfgang R. Windisch personal list. Stalder, H. A., Wagner, A., Graeser, S. and Stuker, P. (1998): Mineralienlexikon der Schweiz. Wepf (Basel), p. 291. Witkind, I.J. & R.E. Thaden (1963), Geology and uranium-vanadium deposits of the Monument Valley area, Apache and Navajo Cos., AZ: 123. Anthony, J.W., et al (1995), Mineralogy of Arizona, 3rd.ed. : 315; Williams, S.A. (1979), Girdite, oboyerite, fairbankite, and winstanleyite, four new tellurium minerals from Tombstone, AZ, Mineralogical Magazine: 43: 453-457; Rocks & Min.:57:12. Anthony, J.W., et al (1995), Mineralogy of AZ, 3rd.ed. : 193; Granger, H.C. & R.B. Raup (1969), Geology of uranium deposits in the Dripping Spring quartzite, Gila Co., AZ, USGS PP 595. Granger, H.C. & R.B. Raup (1969), Geology of uranium deposits in the Dripping Spring quartzite, Gila Co., AZ, USGS PP 595; Granger, H.C. & R.B. Raup (1959), Uranium deposits in the Dripping Spring Quartzite, Gila Co., AZ, USGS Bull. 1046-P: 457-459. Granger, H.C. & R.B. Raup (1959), Uranium Deposits in the Dripping Spring Quartzite, Gila Co., AZ, USGS Bull. 1046-P: 469-470. Anthony, J.W., et al (1995), Mineralogy of Arizona, 3rd.ed. : 297; Granger, H.C. & R.B. Raup (1969), Geology of uranium deposits in the Dripping Spring quartzite, Gila Co., AZ, USGS PP 595. Granger, H.C. & Raup (1959), Uranium deposits in the Dripping Spring Quartzite, Gila Co., AZ, USGS Bull. 1046-P: 467-468. Collected by C. Lemanski, Jr.
Galbraith, F.W. & D.J. 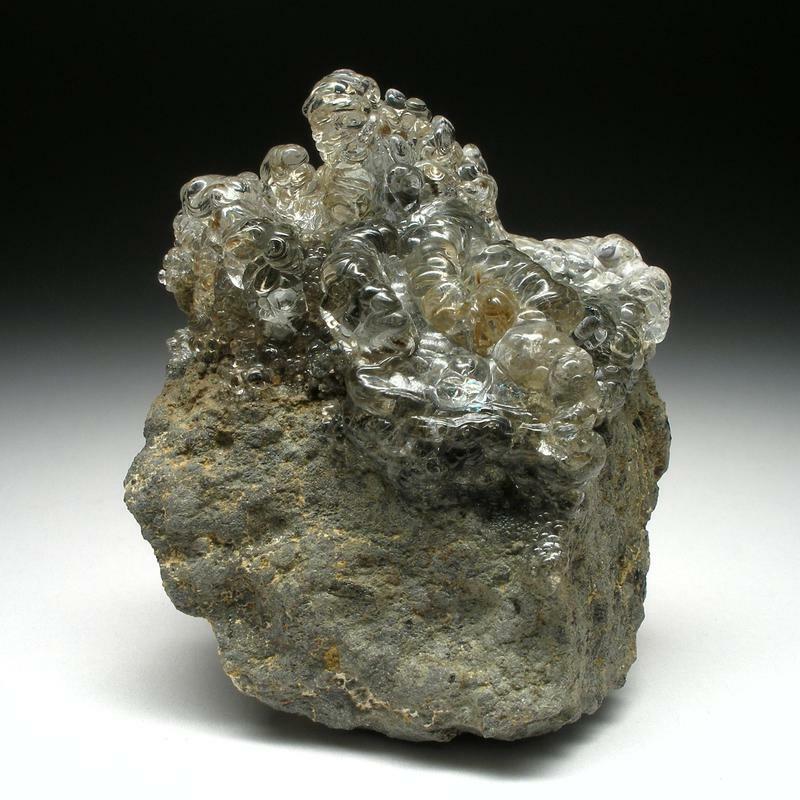 Brennan (1959), Minerals of AZ: 87. Schrader, F.C. & J.M. Hill (1915), Mineral deposits of the Santa Rita and Patagonia Mountains, Arizona, USGS Bull. 582: 361. Pemberton, H. Earl (1983), Minerals of California; Van Nostrand Reinholt Press: 355. Lemmon, Dwight Moulton (1941b), Tungsten deposits of the Benton Range, Mono County, California: USGS Bulletin 22-S: 591; Murdoch, Joseph & Robert W. Webb (1966), Minerals of California, Centennial Volume (1866-1966): California Division Mines & Geology Bulletin 189: 176, 282; Pemberton, H. Earl (1983), Minerals of California; Van Nostrand Reinholt Press: 355. Woodford, A.O., Crippen, R.A., and Garner, K.B. (1941) Section Across Commercial Quarry, Crestmore, California. American Mineralogist: 26: 366, 368; Woodford, A.O. (1943), Crestmore minerals: California Division Mines Report 39: 359; Pemberton, H. Earl (1983), Minerals of California; Van Nostrand Reinholt Press: 356. Cordova, E. M. 2009. Personal communication with S. L. Ritchie, SDMC, Feb.
collected specimens by Alan Goldstein. Januzzi, Ronald E. (1994): Mineral Data Book, Western Connecticut and Environs. The Mineralogical Press, Danbury, Connecticut. ⓘ Sky Ridge railroad cut ? Januzzi, Ronald E. (1976): Mineral Localities of CT and Southeastern NY State. The Mineralogical Press, Danbury, Connecticut. field trip report, Garnet Gazette, December 2004, p 3. Shepard, Charles U. (1837), A Report on the Geological Survey of Connecticut. Hamlen, New Haven. Jones, Robert W. (1960): Luminescent Minerals of Connecticut, A Guide to Their Properties and Locations. Jones, Robert W. Jr., (1960), Luminescent Minerals of Connecticut, A Guide to Their Properties and Locations. Fluorescent House. Branford, Connecticut. Brace, John P. (1823), Miscellaneous Localities of Minerals. American Journal of Science: s.1, 6: 250-1.; Shepard, Charles U. (1837), A Report on the Geological Survey of Connecticut. Hamlen, New Haven. Cordua, Bill (1969) Mineralogy of a newly exposed granite near White Oaks, MD: Rocks and Minerals: 44 (2): 114-115. Gleba, P.P. (1978) Massachusetts Mineral and Fossil Localities. Krueger Enterprises, Cambridge, Massachusetts, 117 pages plus maps. Januzzi, 1976. Mineral Localities of Connecticut and Southeastern New York State (Taylor Assoc./Mineralogical Press). Chapter: "Massachusetts Mineral Localities," p206; Rocks & Min. : 21:75. NJ State Geol. Ann. Rpt. (1856):175. American Muiseum of Nat. History, NY, specimen(s); Paterson, NJ, Museum specimens; Rocks & Min. : 59:157-183, Peters, Joseph J. (1984). Alfredo Petrov, field observations on material displaced during hurricane Irene, August 2011. Rocks & Min. : 7:91; 8:38. Rocks & Min. : 6:101 & 9:136-137. Rocks & Min. :7:148 & 8:40. Ref. : Dana 6:499, 560 & 1077. Rocks & Min. :11:77 & 60:92. Rocks and Minerals (1985) 60:84-93,99; U.S. Geological Survey, 2005, Mineral Resources Data System: U.S. Geological Survey, Reston, Virginia. Eckert, Allan W. (1997): The World of Opals, p. 346. Palache, C., Berman, H., & Frondel, C. (1951), The System of Mineralogy of James Dwight Dana and Edward Salisbury Dana, Yale University 1837-1892, Volume II: 992, 1056.; DANA R. KELLEY AND PAUL F. KERR (1958) URANO-ORGANIC ORE AT TEMPLE MOUNTAIN, UTAH. BULLETIN OF THE GEOLOGICAL SOCIETY OF AMERICA VOL. 69. PP. 701-756. Sirbescu, M. L. C., E. E. Hartwick, E.E., & J. J. Student (2008): Rapid crystallization of the Animikie Red Ace Pegmatite, Florence county, northeastern Wisconsin: inclusion microthermometry and conductive-cooling modeling. Contributions to Mineralogy and Petrology: 156: 289-305.